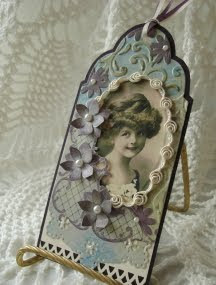 Antiqued Glimmer Tag from Dec 09 / Jan 10 newsletter. The only stamp used is from Sweet Impressions. 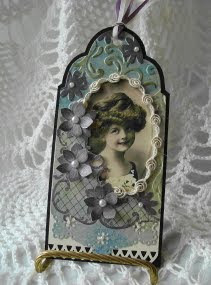 The Little Girl is a graphic from Vintage Stampers Freebees. Wow! I'm curious as to how you achieved the texture on this tag. It is wonderful! Had to come over from the TJ group to tell you how much I love this beauty. Your work is always so beautiful. TFS. Breathtakingly Gorgeous! I just love your art! Absolutely gorgeous! Is that quilling framing the image? I just had to pop over and comment on this, it is so beautiful!